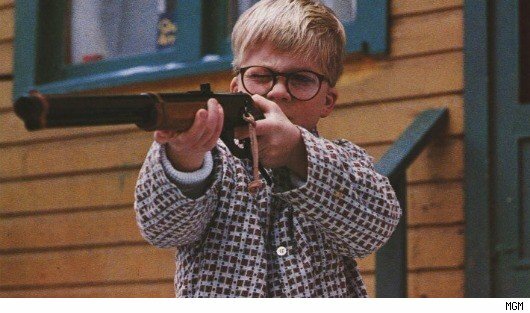 Long ago, a child was born unto this earth for one reason and one reason only: to possess an official Red Ryder, carbine action, two-hundred shot range model air rifle! For those of you who know me personally, you know that around this time of year, my eyes begin to glow with a deep-burning lust of the classic Christmas film, A Christmas Story. My ringtones will reflect it. I’ll start randomly quoting the beloved characters (“Ovaltine? A crummy commercial?!”). I just can’t wait until 8 p.m. on Christmas Eve! It’s been a long-standing family tradition to watch as many of the signature 24 continuous hours of the film as possible, and this year will be no different. I haven’t had a TV in my bedroom for a couple years, but I’m moving one back in for the night so I can lull myself to sleep to the dulcet tones of the Old Man’s perpetual strains of obscured vulgarities. He’s like any other young boy around Christmas, lusting after the one present he wants more than any other. In his case, it’s the Red Ryder BB Gun. The entire film shows his quest to receive the blue steel beauty, first by appealing to his parents’ better sensibilities (by loading his mother’s Look magazine with Red Ryder sales pitches), then to his teacher by writing a theme (which garners him a C+), and finally to the Big Man, Santa Claus himself. Of course, in the end, Ralphie’s father buys him a Red Ryder, and he runs into the backyard almost immediately to try it out. Ralphie pins the target to a metal sing… and immediately shoots his eye. Overall, I’ve always cited this as my absolute favorite Christmas movie, one that crosses over onto my list of all-time favorite movies, regardless of genre. There are others out there, though. National Lampoon’s Christmas Vacation is a very close second for me, and animated classics like The Nightmare Before Christmas and Dr. Seuss’s How The Grinch Stole Christmas (the 1966 one with Boris Karloff) always warm my heart. 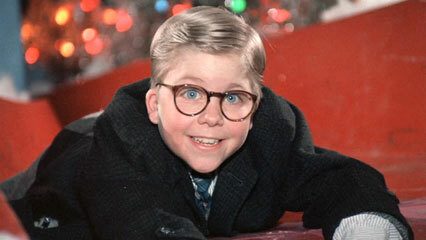 But it’s simply not Christmas until I see Ralphie in that sappy pink bunny suit at least 5 times. I never could explain it. I’ve seen the movie literally hundreds of times, but it’s never enough. Inevitably, I’ll watch the film at least 7 of the 12 times it’ll be on today and tomorrow, and I’ll spout the quotes along with the characters, laughing like a moron all the while. But, it’s Christmas, so the behaviour can be excused. Merry Christmas to you all, nerds! Enjoy time with your families, have a big cup of eggnog, and warm up by the yule log. We’ll see you in the new year. Oh, and try not to use up all the glue on purpose.